Editor’s Note: This article was first published by GreenBuzz, an association that supports sustainability on regional and international levels through research, education and networking. The article was authored by Marco Blumendorf and originally appeared here. What is a Sustainability Lab? In our Sustainability Labs event series GreenBuzz Berlin e.V. connects citizens and initiatives, which operate on neighbourhood level to develop innovative, realistic and sustainable solutions which protect the climate in the neighbourhood. After defining and kick-starting your solution in one of the three Sustainability Labs, GreenBuzz Berlin will support and fund the next steps to bring your idea to life! After several ideas ranging from creating a “Kiezkaufhaus” over supporting the “Solidarische Landwirtschaft” to creating an awareness campaign to buy locally have been discussed, a focus was set on the needs of online shoppers and their current barriers. While online shopping contributes to sustainability by reducing large heated and lit up department stores to highly effective warehouses, it still raises the question of how to best distribute the bought goods to the end-users. Especially with today’s demands for job flexibility, various needs like reliability, flexible, traceability, easy returns, and a good feeling when ordering are yet largely unaddressed. As barriers, a lack of choice of delivery service, difficult parking situations, time pressure, price sensibility, language barriers, and traffic situation have been identified. Based on these insights, criteria for a hub have been collected. Ideally the solution would save CO2 through less traffic (delivery vans) on the streets because of a centralisation aspect as well as the possibility to deliver parcels by cargo bikes (from the hub to the end-consumer). Based on these findings, an action plan has been devised, comprising research tasks to find best-practices and existing approaches, developing a budget and identifying funding opportunities, investigating legal issues, scouting possible locations and forming a network of interested parties. Over the course of the next few weeks these actions should be put into practice and soon we will hopefully see the first neighborhood “Drop-Off Hub” in action, somewhere in Kreuzberg. The Urban Solar project is a new concept from SunCrafter to help improve the quality of life in cities and reduce CO2 emissions produced from within. 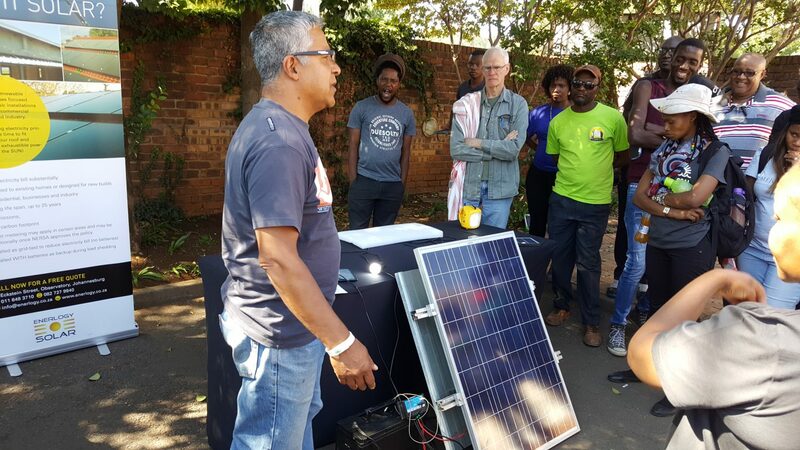 With the aid of upcycled solar panel generators, charging stations (for e-bike, phones, cameras etc) can be strategically positions throughout the local community to increase e-mobility and help make renewable energy and circular economy products part of more people’s lives. 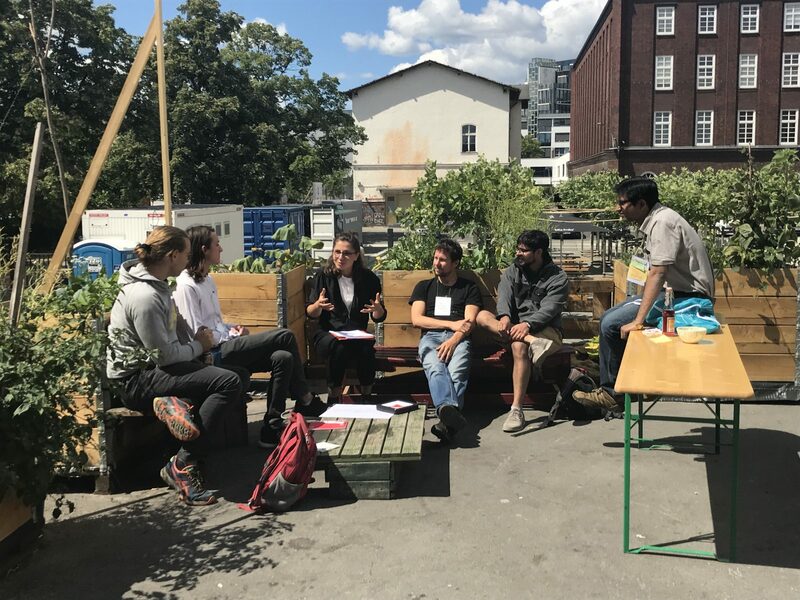 The Sustainability Lab Kreuzberg was a great opportunity to pitch this idea to a bunch of sustainability enthusiasts and receive honest and constructive feedback to help further develop the concept to best cater for the local area of Kreuzberg. After the pitch, the workshop participants divided into two teams. Aurélie Ferron, a Design Thinking coach, led the SunCrafter team. She led us through a detailed process of finding out who our market is, what the market needs and how to tweak our product to best cater for them. Aurélie had our team divide into groups several times, each time working with new people on new tasks, from interviewing people on the streets of Kreuzberg to brainstorm solutions for problems. Each task brought our product closer to a viable and useful tool for the people of Kreuzberg to reduce CO2 emissions. Each team brainstormed solutions for the challenge at hand. The number of ideas discussed per team was around 50. However, each team focused on one winning idea which they prototyped. Based on these results, we are now working on the first prototypes together and continue to follow and support the groups throughout the process. Involving and informing the public about these projects as well as additional projects are a core responsibility of GreenBuzz Berlin in that regard. Sounds like something you want to do as well? Take the sustainability labs to your country and city, empower initiatives and citizens and help save CO2 on a local level!